Recent scientific reports demonstrate that despite more than thirty years of environmental regulation, bird and wildlife species as well as ecosystem services, are in unprecedented decline. Pesticides are at least in part to blame for these profound declines. U.S. pesticide law has failed to carry out its mission of environmental protection. A number of recently-filed lawsuits assert that the registration of certain pesticides violates the federal Endangered Species Act. One of the great ironies of environmental law is that the ecological consequences of pesticide use, which fueled the environmental movement of the late 1960s and early 1970s, largely have been ignored for the past thirty years. Only recently has interest renewed in the ecological (as opposed to human health) risks posed by pesticides. Moreover, the explosion of pesticidal-genetically modified organism (GMO) use in agriculture raises concerns regarding the novel risks to biodiversity posed by these new pesticides. Surprisingly, however, the Federal Insecticide, Fungicide, and Rodenticide Act (FIFRA) has not changed significantly with regard to ecological matters since 1972 and remains primarily a consumer protection statute not well-suited for ecological protection. The Environmental Protection Agency's (EPA) implementation of FIFRA has not kept pace with our developing understanding of the uncertainty, complexity, and changing nature of ecological systems. This Article breaks new ground by being the first to use the new legal discipline of "eco-pragmatism" to analyze, and then reinvent, U.S. pesticide law to better protect ecological resources. For years, environmental legal scholars have sought a middle ground between absolutist risk-based approaches to environmental regulation and cost/benefit analysis approaches. In the past several years, scholars have begun exploring the emerging field of eco-pragmatism -- a dramatic new framework for environmental decision-making developed by Professor Daniel Farber -- to achieve a workable middle ground. Although a number of prominent legal scholars have analyzed eco-pragmatism in a general sense, none have applied an eco-pragmatic framework to any environmental pollution control law. This Article is the first to do so. 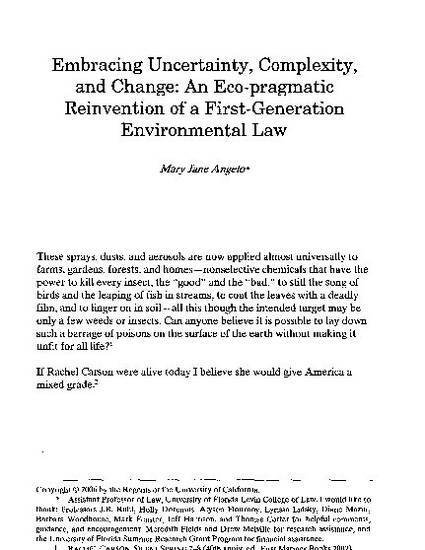 This Article builds on Farber's work and others by first bolstering eco-pragmatism through consciously incorporating principles of ecological science and then applying the strengthened eco-pragmatism to a long-overlooked area, pesticide law. As the first application of ecopragmatism to a field of environmental pollution control law, this Article is an important step in the development of this area of legal theory. By analyzing current pesticide law as well as EPA's implementation of such law through an eco-pragmatic lens, this Article identifies areas of the law in need of revision and proposes revisions based on eco-pragmatic principles, which if implemented would greatly enhance our ability to protect critical ecological resources.